Looking for perfect fishing gifts for your boyfriend? 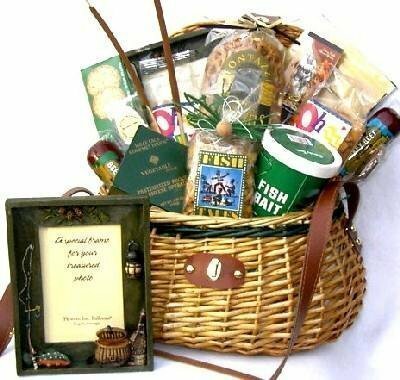 Coming up with gift ideas for fishing enthusiasts can be a difficult task especially if you are not familiar with fishing gear and equipment. You just might spend the entire day scouting for unique fishing gifts and still end up with nothing to buy. From fishing rods to apparel, there is a variety of unique fishing gifts to choose from. However, if you are clueless about fishing, you may find it hard to pick out the perfect present. You may have this fear of buying something that is of poor quality, or worse, purchasing an item that will be of no use to your boyfriend. Worry no more! We have listed down creative and foolproof fishing gifts for your reference. You might consider getting these items for your boyfriend, or even for yourself while you’re at it! If you are looking for an ergonomic gift, our top recommended item is for you. The Deeper Smart Fishfinder 3.0 is a present any fisherman boyfriend would love to receive. It is known for its functionality which has already been proven and tested. In fact, it has gotten over 1,300 customer reviews on Amazon. This Smart Fishfinder is a handy wireless device for all types of fishing. The kit comes with a transducer and software. All you need to do is to install the software in your phone or tablet–either Android or iOS, connect the transducer via Bluetooth, and you are good to go. 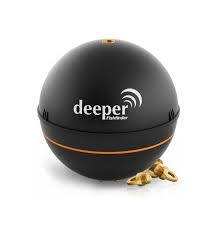 It has adjustable sensitivity and dual frequency sonar with a range of up to 130 feet underwater. With underwater technology commonly used in consoles of fishing boats, this item can transmit bottom and water column information such as depth, structure, temperature, vegetation, and of course, fish location. Truly, this is a “single solution” gift your partner would really appreciate. Buy this item now on Amazon or take a look at the Pro and Pro+ models. Tackle is essential in every fishing session and finding the best bag to keep everything in place can be a challenge. 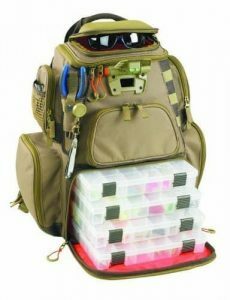 When it comes to fishing tackle storage, the number one on our list is the Wild River NOMAD Lighted Tackle Backpack. This is one of the best storage items in the market and the answer to your boyfriend’s storage woes. Packed with a lot of features, this backpack has a lot to offer. The best part is its integrated LED system which makes it the perfect companion for night fishing. Its large upper storage area has a removable divider to meet your storage needs. Anglers can neatly tuck their tools in web loops, pliers in a specialized removable holder, and other items in mesh pockets for easy checking. The bag can accommodate 6 medium no. 3600 or 4 no. 3500 trays. The front cover folds down and serves as a work surface while the base pads keep the bag clean and dry. Your boyfriend shouldn’t worry about getting his tackle wet because the bag comes with a rain protection cover. He might also like the molded sunglasses holder which lets him fish in style. Get him this backpack and see his eyes light up with your surprise. Anglers may find it hard to stay dry when fishing especially since they are dealing with water. This item in our fishing gift list will keep any angler’s belongings dry and safe. 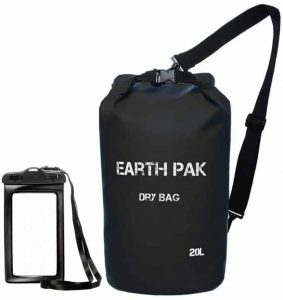 Made of 500D PVC material, the Earth Pak Waterproof Dry Bag offers security like no other. You can choose from a range of sizes that are fit for different outdoor activities. For small fishing trips, 10-20L bags are available and come with a single shoulder strap. Bigger 30-40L bags are also in the market for kayaking, boating, and rafting. These come in backpack styles. You can also get hold of their 55L dry bags to keep all of your clothes and valuables safe in one pouch when traveling and trekking. Since these bags are available in a variety of colors, you do not need to worry about getting the right color for your boyfriend. What’s special about this product is that it comes with a freebie– an IPX8-certified waterproof phone case that has dual-sided clear windows, simple snap, and 6.5-inch size which can fit most smartphones. When used properly, this dry bag can last years even for rugged users. Buy this dry bag and phone case as fishing gifts for your boyfriend and yourself here. Lures are a top necessity when it comes to fishing. This is why getting lures as fishing gifts for your boyfriend is definitely a good idea. Different lures attract different species of fish and those not knowledgeable might find picking the right lure tricky. If you’re having second thoughts, we suggest you give your partner a bit of everything. The Goture Fishing Lures Set with Tackle Box has a wide variety of fishing lures. You will never go wrong with this set because it contains 197 vivid fishing lures and accessories that are very useful for your boyfriend’s fishing session–may it be saltwater or freshwater. Of this number, there are 6 hard lures, 12 metal lures in gold and silver, and 63 soft lures such as earthworm and shrimp, to name a few. Aside from that, you will also be getting 116 accessories which include hooks, leader lines, crank hooks, jig hooks, sinkers, swivel with a snap, split rings, fishing beads, and movable red tails. The set also comes with a tackle box to store all of these fishing goodies. Don’t miss out on this practical gift. Buy one now! Collapsible telescopic fishing rods are perfect fishing gifts for boyfriends who are always on the go. These rods are very convenient to carry around since these are portable and can collapse into a small piece of metal. The Plusinno Telescopic Fishing Rod is our top pick when it comes to these kinds of rods. The Plusinno Telescopic Fishing Rod is a popular choice for anglers because of its durability, sleek design, and functionality. It is made of an elastic and dense mix of carbon fiber and fiberglass. In addition, it has waterproof and anti-seawater corrosion properties. It is lightweight yet strong enough for battling with big fish. You may get yours here or you can go through our list of top collapsible telescopic fishing rods. Ice fishing is a unique experience and truly one for the books. Great ice fishing rods make these experiences better. Our most recommended rod for this type of fishing is the Shakespeare Ugly Stik GX2. In contrast to its name, the Shakespeare Ugly Stik GX2 is a reliable rod and a cool fishing gear gift. Made of fiberglass and graphite, it is known for its increased sensitivity and strength. It is composed of materials that are built for braving the cold weather. Its EVA foam handle grip is comfortable and good for the angler’s hands. Overall, it is a bang for your buck and definitely a present that your boyfriend will appreciate. You can purchase this rod here. For more options, you may check out our top picks for ice fishing rods. Catching fish brings excitement to professional anglers and hobbyists alike. Usually, the first thing that they do with their catch is to measure its weight. Whether big or small, this brings excitement to fishing enthusiasts which makes giving a weighing scale as a present a pretty good idea. One of the best fishing gadgets available which we highly recommend is the Dr. Meter Digital Fishing Postal Hanging Hook Scale. Aside from being the “Ultimate Measure of Accuracy”, this scale is portable and does not require much space for storage. It can measure up to 110 lbs with an accuracy of 5g/10g and can give measurements in g, kg, lb, and oz. Not only is it able to weight your boyfriend’s catch but it can be used to weigh luggage as well. You can also measure length because it comes with a built-in tape with cm, m, and ft measurements. You and your boyfriend don’t need to worry when using this without ample light since it has a night vision feature for its big LCD display. On top of that, it has a switch, data lock, and auto off features. Durability is guaranteed with its steel weight hook and metal hand strap. What are you waiting for? Grab this super functional gadget with a 12-month warranty here. It can get very hot when you and your boyfriend go fishing outdoors, thus, the need to stay hydrated. The YETI Rambler Jug is perfect for keeping drinks cold for long fishing trips. It works fine as well for soups and liquids that need to stay hot. Half-gallon and gallon YETI Rambler Jugs are available in the market. Both sizes have double-wall vacuum insulation, 18/8 stainless steel construction, an ergonomic steel handle, and a MagCap™ that locks into its dock. This gift is perfect for showing your concern to your fisherman boyfriend. You may get one, or even two for you and for him, here. Apparel and merchandise are good fishing gifts that boyfriends surely will like. For one, these are no-frills and you do not need to know your boyfriend’s fishing preferences to be able to decide which one to buy. We suggest you get the AKIZON Fishing Baseball Trucker Cap to protect your partner from the heat, rain, and even wind. This trucker cap has a nice fish print and cool design that any fishing enthusiast would wear. Made from 100% unstructured washed cotton denim, it offers style and comfort. 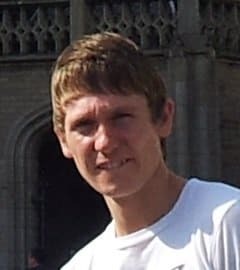 Its low-sitting brim has a sweatband which prevents sweat from dripping to the wearer’s face. It is fully adjustable to fit different head sizes with its touch fastener and buttonhole. Girls looking for funny fishing gifts will like this Eat Sleep Fish Repeat T-shirt. The print is quirky, catchy and will give you a good laugh. It is professionally printed on a basic short-sleeve crew neck shirt made of imported fabric. It has unisex sizing which means it fits both men and women from small to 6XL. You can choose from a variety of colors– black, charcoal, forest green, kelly green, maroon, military green, blue, purple, red, brown, heather gray, and royal blue. Whether you decide to give your boyfriend a gadget, rod, or shirt, the most important thing that you must consider is the quality. The items on our list are guaranteed to last long as these are made of quality materials. We have also taken into consideration its practicality and functionality depending on the nature of the product. Surely, your boyfriend will appreciate it if you give him one, two, or even all of our recommended fishing gifts.